Charles Spencer Mann later built the Lookout Mountain Inn. The inn, which burned down in 1920, is shown in the photo above taken in 1916. Charles Mann, the original developer of Laurel Canyon, is not the same Charles Mann who founded the real estate office at Kirkwood and Laurel Canyon Blvd, and there is no relation. Just a coincidence of history. 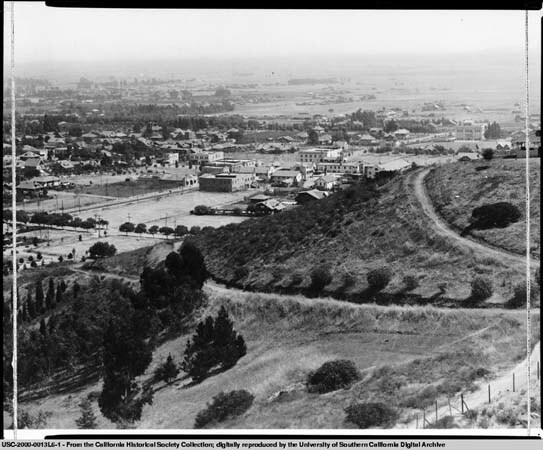 This panorama was taken from Lookout Mountain at the top of Laurel Canyon in 1906. This is really an amazing view showing clear details of Hollywood below. The following images are sections from the panoramic above. 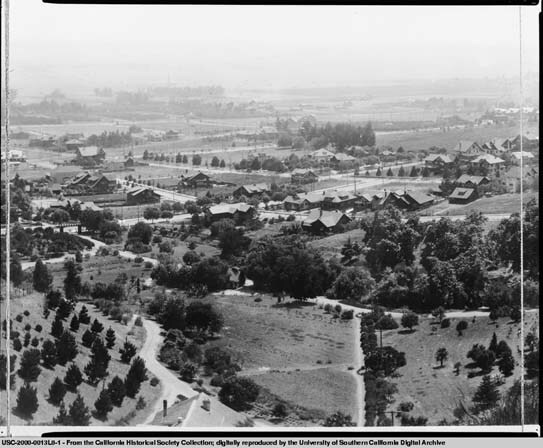 What is so surprising is the extent of development of Hollywood and the adjacent ranchos in the early 20th Century. Of course, Los Angeles was over 100 years old by this time, but Anglos had controlled the area for less than 50 years. They seem to have been well established, building homes and planting trees, by this time. This was the nation's first trackless trolley, built by Charles Spencer Mann in 1910 to promote vacation lots in Laurel Canyon. 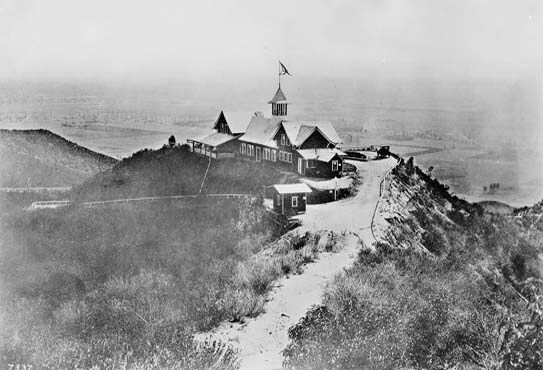 The trolley ran along Laurel Canyon's dirt road and connected Sunset Boulevard to the base of the current Lookout Mountain Avenue where there was a small inn. The Laurel Tavern served lunch to tourists and prospective customers of Mann's Bungalow Land properties. The ride cost 10¢. More adventurous travelers could continue up Lookout Mountain Avenue for a breathtaking view of Hollywood from the area around the current Appian Way. Photos from the California Historical Society Digital Archive.